Bhubaneswar: Kalinga Institute of Medical Sciences (KIMS), a leading medical College and hospital in Odisha, on Tuesday signed a memorandum of understanding (MoU) with the Department of Social Security and Empowerment of Persons with Disabilities, Government of Odisha, to work together for the development and welfare of the Divyangs (Persons with Disabilities) across the state. 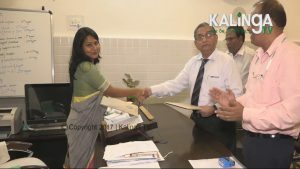 The MoU was signed at Capital Hospital in Bhubaneswar in the presence of Director of the Social Security and Empowerment of Persons with Disabilities Department Mansi Nimbhal and Medical Superintendent of KIMS Major General Dr PK Patnaik and other dignitaries. According to the MoU, KIMS will make a separate data base for Divyang patients admitted in the hospital, besides providing treatment to them. Next, it will submit the data base to the state government periodically, which will rehabilitate the Divyang patients and look after their social security.